This account of Combined Operations training for the 1st Canadian Corps is presented in two parts. The first part comprises the personal recollections of Canadian war artist, Lt W A Ogilvie and the second is an official report from Canadian Military Headquarters. To go direct to Part 2, click here. 1. In accordance with instructions, I reported to HQ 2nd Canadian Infantry Brigade on 13 Feb 43. I was attached to Princess Patricia's Canadian Light Infantry during their period of training in Combined Operations at Inveraray. This lasted until 4 Mar 43. I was then attached to the Royal 22nd Regiment, 3rd Canadian Infantry Brigade from March 4 to March 20. Being primarily concerned with the pictorial possibilities offered by this training, these observations were made with the object of giving me a better technical understanding of what occurred in subjects selected for paintings and drawings. The notes, therefore, are very general in character and deal with visual, rather than a strictly operational, aspects of the training. 2. As mentioned above, I reported to HQ 2 Cdn Inf Bde at 1130 hrs on Saturday, 13 Feb 43. The brigade moved the following morning, Sunday 14 Feb, for the Combined Training Centre, Inveraray, where they were to undergo a period of training in Combined Operations. I was attached to the PPCLI and moved with the battalion from Battalion Headquarters at 1245 hrs for Eastbourne train station, where we entrained. Battalion vehicles, which were necessarily restricted in number, had already been loaded on to flat cars. Officers and men had been issued with a haversack ration for three meals. En route, there was one stop at Leicester, where, at 1915 hrs, troops were quickly and efficiently served with hot tea. On arrival at Gourock at 0900 hrs, the PPCLI immediately detrained and were marched, by companies, on to the ship Maid of Orleans, which also served as transport for the Edmonton Regiment; the Seaforths embarking on the St. Soreil. 3. Weather conditions were cold, with a driving wind and sleet. 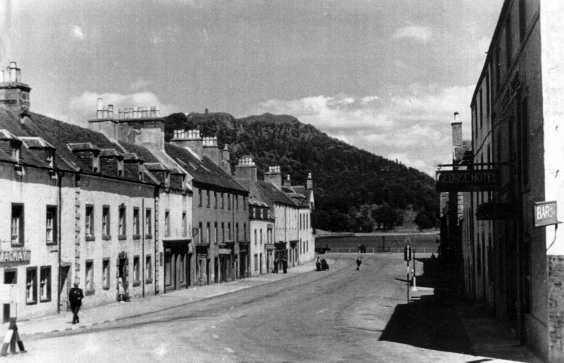 Troops were kept below decks during the trip to Inveraray, where both ships arrived at 14.30hrs. At this time it was low tide so the troops were taken off by drifters to the pier and immediately marched to their respective camps; the PPCLI to Dukes Camp, the Edmontons to Shira and the Seaforths to Castle Camp. These camps were pleasantly situated near the mouth of the river Aray; here about 20 yards wide. The river was noted as one of the finest salmon fishing streams in Scotland and it was evident that considerable care had been expended on it. In places, the bed of the stream had been flagged and much work had been done to shore up the sides to prevent undercutting. There were numerous warning signs regarding any attempts to fish it. Nearby was the Duke of Argyle's castle, a stone structure impressive in mass but of indeterminate architectural origin. A dominating part of the landscape was Dun na Cuaiche rising from the north bank of the river to some 750 feet. On top of it was one of the old watchtowers which served as a lookout and refuge for the Campbells during the earlier days of Clan warfare. 4. Castle Camp, about half a mile from Inveraray, a typical Scottish fishing village, was situated at the north end of Loch Fyne. Lying in Newton Bay were three LSIs (Landing Ships Infantry); HMS St. Helier, HMS Brigadier and HMS Duke of Argyle. Off Admiral beach were moored flotillas of small landing craft of various types, while LCTs were anchored between Admiral and RE beaches. Moored to one side of the pier itself were numerous other types of landing craft, mainly LCAs, LCPs and LCMs. 5. Training was most concentrated and began, as far as the infantry battalions were concerned, with exercises from dummy landing craft on dry land. The early stages of training took place during the day, so as to familiarize troops with landing exercises, which would subsequently take place at night. Included in the training were rope climbing and cliff scaling, also practice on scramble nets progressing to dummy LCA and wire crossing. 6. Four scramble nets were erected on an open space of ground. They were constructed of steel frames, some 20 to 30 feet high and approximately 15 feet in width, from which rope nets were hung and secured. Usually, companies were detailed for this work during a morning or afternoon period, the men going up and over in platoons under the direction of their individual platoon commanders. Climbing this net presented more difficulties than one slung from the side of a ship, since there was little purchase for the feet on the practice nets. The side of the ship helped in this respect. In battle order and carrying weapons slung required a good deal of strength, particularly in the arms. Instructors were careful to point out that the horizontal bar in the net was for use of the feet only and should never be used as a grip for the hands; the vertical being used for the latter purpose. The reason being, that should one's grip slip on the vertical rope there was always a chance for recovery. Certainly the practice on these nets gave one confidence when, later, it was necessary to board and disembark by this means in complete darkness from LCIs. 7. Three wooden dummies, which were replicas in dimension and general structure of an LCA, were used in the first stages of this training. The dummies were built at the bottom of a forward slope, the upper part of which, at a distance of 30 yards or so from the dummies, being wired with concertina. The men were instructed in the correct method of loading craft; the importance of the various individuals, in sections, taking their proper places and how and in what order these sections moved out on beaching. Wire parties, usually consisting of three men, would rush from the craft down the ramp under covering fire (generally from a Bren gunner in the forward turret) carrying three rolls of chicken or rabbit wire. One method was for two men to carry one roll, while the third followed up carrying the others. The rolls were then thrown over the barbed wire and gaps cut, if necessary, by the wire cutters. Having prepared the gaps, the wire party took up positions to give covering fire for the sections to follow. A further advance in this training was made when similar exercises were carried out from moored LCAs. Three of these craft were moored on the shore of a small loch, Loch Dubh. Procedures were similar, except that the men became familiar with the craft, though these were earlier models of LCAs. 8. Progressing from this stage, men were loaded into beached craft, which pulled themselves off with their kedge anchor and then proceeded offshore some distance. They would then turn about and come in for the practice assault landings. These assaults were carried out both by platoons and companies as a preparation for similar operations at night. In the final stages, loading of craft usually took place from an LSI. Troops were taken out to the LSI by drifters, going aboard the mother ship (the LSI) up the scramble nets. The various platoons were given serial numbers and remained below decks. An orders group meeting was held with all Navy officers, Army officers and coxswains of craft in attendance, at which an explanatory lecture was given by the MLO (Military Landing Officer). All platoon and company commanders were introduced to their naval opposite numbers. Platoon and other commanders then returned to their formations below deck. Just prior to zero hour, the MLO gave a talk over the ship's loudspeaker with a general explanation of how serials will move, the necessity for no lights and a strict observance of radio silence, etc. At zero hour, all lights were extinguished, serial numbers were called by the MLO, at which signal platoons moved to their boat stations guided by naval ratings. The men then went over the side, down the scramble nets, into their respective craft. On occasions, the landing craft themselves were winched up to deck levels by specially constructed davits made of structural steel and the men boarded from there. 9. Serials called, the platoons came up from below, crossed by a small platform into the craft, which were then lowered into the water. It was carefully explained to the troops that the craft would be dropped when about two or three feet above the water. This was done to avoid capsizing in a rough sea or swell should one end of the craft be waterborne earlier than the other. The loaded LCAs then moved off and assembled in their predetermined formations in order to approach the beach for the assault landing. 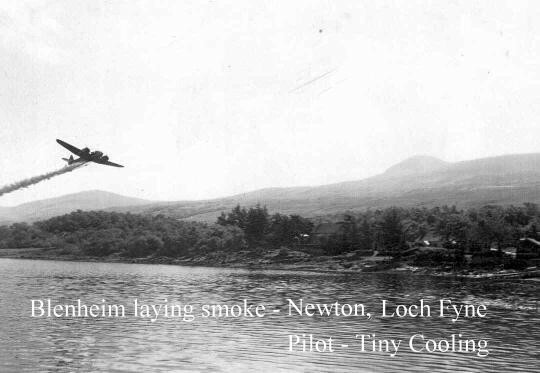 From this stage to just before landing, the coxswain or other naval OC of the craft, was in full command. An interesting point arose in this training due to the reorganization of the infantry platoon. The LCAs were designed to carry the former establishment and now, of course, with an overflow, arrangements must be made to accommodate the extra men, so that a full platoon was not necessarily embarked in one craft. 10. The loading of artillery into LCTs presented various problems. Field artillery was loaded by driving fully limbered into the craft, where the limber and gun were man-handled by the crews and turned about. The quads (tractors) were driven out and then backed in once more, so that when limbered up, all were ready to move out immediately on beaching. As far as LAA (Bofors) were concerned, this procedure could not be adopted because of the length of the gun and carriage. This necessitated first, unlimbering on the beach, man-handling the gun backward into the craft and finally backing the tractor in when the gun was limbered up once more. In all instances of man-handling guns, including anti-tank, it was necessary for gun crews to team up and haul in with tow ropes. At this early stage of the training, loading took place in daylight from Admiral beach. The LCTs then proceeded to other beaches, such as Ardno, where the artillery unloaded and went through such exercises as their battery commanders had arranged. These were usually of short duration, so that the craft could return to allow further practice in loading and unloading. 11. All of this training led up to similar training in night operations. Conditions varied considerably from moonlight nights which were fairly clear to nights when visibility was poor with driving rain. Beach conditions varied also from rocky surfaces, which meant hard work in man-handling the guns, to surfaces of comparative smoothness. The backing of vehicles up the ramp and into the craft was usually directed by the troop sergeant, using a series of hand signals. This required some skill on the part of the driver and at night, when no lights were allowed, he had to rely on signals which were given by means of a hand torch. Much importance, as in all of these operations, was attached to the time element and it was surprising how quickly and skilfully the crews handled their guns, after so short a period of training. 12. On 10 Mar 43, I went on board His Majesty's Hospital Carrier St Andrew in order to make drawings and sketches of an exercise, in which wounded men were to be evacuated from Salmon beach and brought out to the hospital carrier by landing craft. The 9th Field Ambulance, RCAMC, 3rd Infantry Brigade, were engaged in this exercise. Duties, which normally would be carried out by the RAMC, were taken over by RCAMC personnel for purposes of training. The latter, for instance, provided a party of 20 to act as stretcher bearers aboard ship and also a party of 19 ORs to form a beach dressing station. Casualties were picked up by section stretcher bearers and brought to the beach dressing station, where they were loaded into LCAs. The men acted as casualties, including badly wounded and shocked cases and were brought alongside the St Andrew in an LCA, or other type of landing craft. Various methods of taking wounded aboard were used, including the Neil-Robertson stretcher and a box-type of carrier containing the patient and stretcher. A less secure method involved passing loops around the four handles of the stretcher and, as in the two former instances, hauling away by block and tackle from a davit. 13. Casualties were received at the boat deck by stretcher bearers, who carried them down a specially constructed, gently sloping ramp, which led to the lower deck. Painted signs gave directions to the various wards. The first was the reception ward, which was formerly a lounge. Stripped down, it had a series of benches on the starboard side, where walking wounded were attended to and labelled. Down its length were three built-up wooden box-like structures about the width of a stretcher and approximately 3 feet high. Stretcher bearers placed their stretchers on to the boxes, which were provided with steam heat by a series of pipes so that the casualty, if suffering from extreme cold or shock, would be kept reasonably warm during a diagnosis. This was undertaken by a MO, assisted by a Staff-Sergeant, a sister and four orderlies. The casualty, having been given any necessary injections, was labelled and removed by the stretcher bearers to the various casualty wards. These were excellently equipped and there was a cheerful atmosphere. On board also was a small operating room. The St Andrew was previously a Channel Island steamer and her conversion into a hospital carrier appeared to be a most efficient and ingenious piece of design. 15. On Sunday, 14 March, I visited RE beach, where the engineers had assembled a three-pier pontoon raft, on which they then ere cted a specially adapted Bailey bridge super-structure. This "long landing bay" was then loaded and the raft towed to the head of a pier, upon which sheer legs had been erected. They provided the means to haul the assembly into position on the pier. The raft was anchored off the pier and the long landing bay drawn up by block and tackle. This formed a bridge from the pontoon raft to the pier. An LCT with vehicles aboard was then navigated into position, so that its ramp, when lowered, was supported by the Bailey bridge. The vehicle was then driven off down the ramp on to the pontoon raft and up the landing by to the pier. 16. The culminating point in all of this training, for each of the two brigades, was reached in two schemes, "Dalmally" and "Eagle". Generally speaking, these exercises were designed, so that the brigade would function as a whole in combined operations, under conditions of both day and night. Assault landings had to be made in order to establish bridgeheads. Certain objectives, such as airfields, were to be captured. Engineers were engaged in demolition and bridging operations. Field, Light AA and anti-tank artillery were landed from LCTs and given supporting roles. A certain amount of air cooperation was provided by bombing attacks, dropping of flares at night and the laying of smoke-screens, while assault landings were taking place. An outstanding feature of this training was the morale of the troops. During a concentrated and continuous period of day and night training, often under difficult conditions and at times with little sleep, the good spirits and keen enthusiasm displayed was quite marked. 1. This Report summarizes the programme of training in combined operations conducted by formations of 1 Cdn Corps during the winter of 1942-43. This has been the most extensive programme of the sort yet attempted within the Canadian Army Overseas, and has affected a larger body of troops than that involved in the training preceding the DIEPPE operation of 19 Aug 42. All the infantry brigades of 1 Cdn Div, other troops of the same division, and a considerable number of units of 3 Cdn Div, took part. 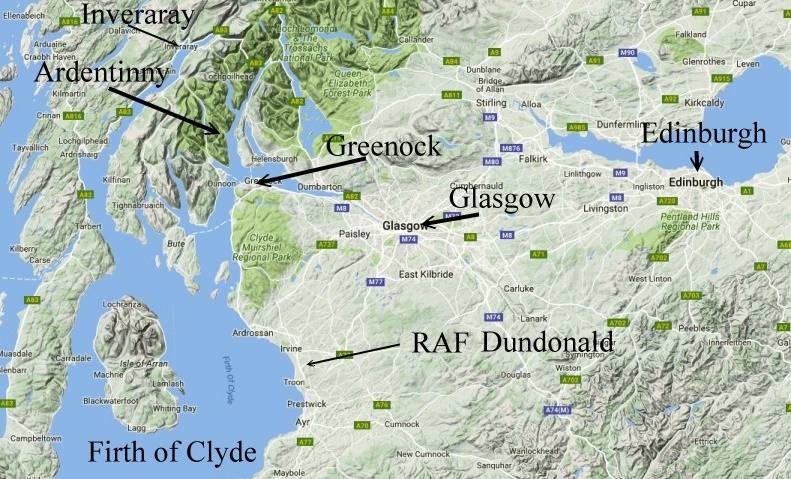 Most of the training was conducted at the Combined Training Centres in Scotland which are operated under the direction of the Chief of Combined Operations. 2. An important pictorial record of this training has been made by Lieut W A Ogilvie, a Canadian War Artist attached to CMHQ, who was present at the Combined Training Centre, INVERARAY, during the training of 2 and 3 Cdn Inf Bdes there. Mr Ogilvie made a large group of admirably vigorous watercolour and other drawings dealing with this training, and at the moment of writing he is engaged in developing some of this material in LONDON. Attached as Appendix "A" is an account written by Mr Ogilvie of the training of 2 and 3 Cdn Inf Bdes as he saw it. The pictures resulting from his stay at INVERARAY are considered to be the most interesting single group yet produced by any Canadian War Artist overseas, and have very material historical value as a record of training methods, equipment and general background. 3. The first instruction concerning the programme of combined training was issued from Adv. HQ 1 Cdn Corps on 2 Nov 42 (CMHQ file 2/COMB OPS/1). This instruction announced that arrangements had been made for combined training for four brigades (1, 2, 3 and 7 Cdn Inf Bdes), with projected arrangements for two more (8 and 9 Cdn Inf Bdes). It stated also that training had been arranged for "Beach Organizations" f or both "maintenance" and temporary beaches; for the training of divisional and corps troops, "to practise drivers in driving on and off craft and appropriate general instruction"; while special courses had been arranged in engineer training for officers and NCOs, planning for Cs RE and field company commanders, beach organization, the work of Forward Observation Officers (RCA), beach signal work, and the waterproofing of vehicles. 4. 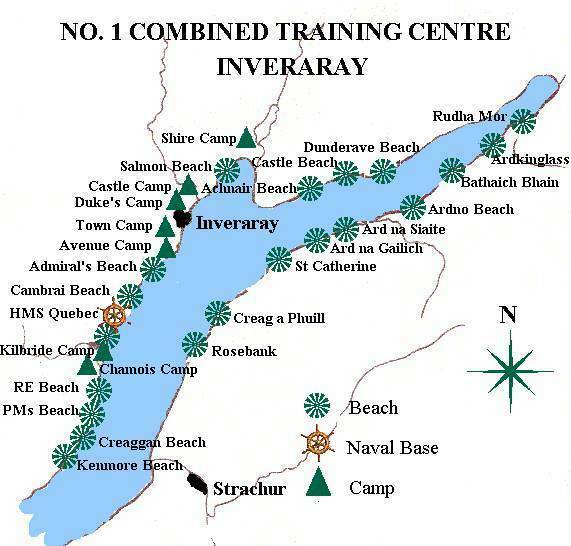 It was anticipated at this time that the infantry brigade training would begin on 27 Nov 42 with the arrival of the advanced party of 1 Cdn Inf Bde at CTC, INVERARAY (map opposite will enlarge until print is easily read), and that 1, 2 and 7 Cdn Inf Bdes would be trained at this centre, while 3 Cdn Inf Bde would be trained at TOWARD. It was hoped that the training of all four brigades might be completed by 15 Jan 43. It was further suggested that 8 and 9 Cdn Inf Bdes, although details were not yet settled, would train in the south with Force J, under Captain J. Hughes-Hallett, DSO, RN, operating from the ISLE OF WIGHT. 5. The programme was not carried out exactly as planned. A revised schedule of training was published on 21 Nov 42, and constant further revisions proved necessary; the training, in consequence, lasted through most of the month of March. The postponements which took place were in part at least the result of the necessity for suspending training at the CTCs in order to make possible the proper maintenance and repair of landing craft used at these establishments. 6. All the infantry brigades of 1 Cdn Div were put through the combined training programme as planned, though as just noted there were many delays. In the beginning, preparatory training was carried out; during the week ending 28 Nov 42, units carried out tactical exercises with troops in combined operations on the platoon and company level, and practised night landings using "mock-up" LCAs (General Report from First Cdn Army, CMHQ file 4/PROGRESS/11). Large-scale training in Scotland began in December. 1 Cdn Inf Bde spent the period from 16 to 31 Dec at the CTC, INVERARAY, training in "wet and miserable" weather (War Diary, HQ 1 Cdn Inf Bde, Dec 42). The brigade was accompanied by one battery of 1 Cdn A.Tk Regt and one of 2 Cdn LAA Regt, RCE detachments, two Beach Signals detachments, and one Field Ambulance (General Report from First Cdn Army, week ending 19 Dec 42). 7. The next complete infantry brigade did not move to Scotland until February. 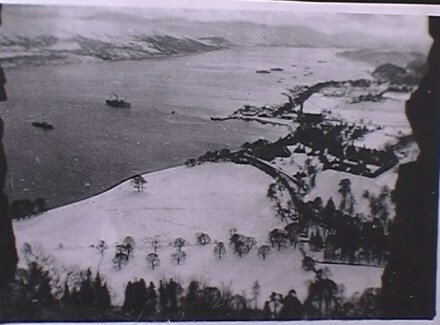 2 Cdn Inf Bde proceeded to INVERARAY on 14 Feb, and there carried out the programme described by Mr Ogilvie. 3 Fd Coy, RCE, and certain other units accompanied it. Early in March 2 Cdn Inf Bde returned to England and was replaced at INVERARAY by 3 Cdn Inf Bde, as described by Mr. Ogilvie. 4 Fd Coy, RCE, and 9 Fd Amb, RCAMC, and evidently certain other units, proceeded to INVERARAY at the same time (General Report from First Cdn Army, week ending 20 Mar 43). 8. The GOC 1 Cdn Div (Major-General H.L.N. Salmon) visited all three of his brigades during their training at INVERARAY (War Diary, "G", HQ 1 Cdn Div, 18 Dec, 24 Feb, 14 Mar). 9. The combined operations training programme prevented 1 Cdn Div from taking part in the important GHQ exercise known as "SPARTAN." During this exercise, 1 Cdn Div (less the troops in the North) "assumed Corps' responsibility by taking over the Corps front in an anti-raid role" (War Diary, "G", HQ 1 Cdn Div, 3 Mar 43). 10. In addition to the units already mentioned, three companies of the 1 Cdn Div machine-gun unit, the Saskatoon Light Infantry (MG), trained in Scotland during January (General Report from First Cdn Army, week ending 23 Jan 43). 11. The training programme for 3 Cdn Div was somewhat abridged, and 7 Cdn Inf Bde, which it had been proposed to train in Scotland, has not undergone this training to the time of writing, although the brigade's beach "brick" trained in Scotland during December (General Report from First Cdn Army, week ending 12 Dec 42). On 13 Mar 43 GHQ Home Forces notified CMHQ that ''as a result of recent changes in priority" the training of 3 Cdn Div which had been scheduled to begin at CTCs on 25 Mar was "postponed indefinitely" (CMHQ File 2/COMBINED OPS/1/2). 12. Nevertheless, units of 3 Cdn Div have had considerable training in combined operations as a result of this programme. During the last week of November, 1942, the battalions of 8 Cdn Inf Bde had three days LSI and LCP training each. This was carried out in the south, the units moving to SOUTHAMPTON, where three LSIs were available, embarking on these, and carrying out night assault landings in LCPs on beaches in the vicinity of the Solent. The Queen's Own Rifles of Canada, the Regiment de la Chaudiere, and the North Shore Regiment successively underwent this training (War Diary, HQ 8 Cdn Inf Bde, Nov 42). The QOR of C had previously had the benefit of combined operations exercises at WARSASH, in the same area, on 5 to 7 Nov (War Diary, 1 Bn, QOR of C, Nov 42). In December this form of training was extended to the units of 9 Cdn Inf Bde, the Highland Light Infantry of Canada, the Stormont, Dundas and Glengarry Highlanders, and the North Nova Scotia Highlanders in succession proceeding to SOUTHAMPTON for LSI training (General Report from First Cdn Army, week ending 12 Dec 42; War Diary, HLI of C, Dec 42). 13. The units of 9 Cdn Inf Bde in succession subsequently underwent a special programme of training in Scotland, at the CTC, DORLIN (See Description No 3 on this UK Training Establishments page). The HLI of C was first to move thither, entraining on 15 Dec 42. Few naval craft were available for training at DORLIN, and the programme carried out was in the main one of Assault Training, with emphasis on hardening (War Diary, HLI of C, Dec 42). The HLI of C completed their training at DORLIN on 4 Jan 43, and were immediately replaced there by the North NS Highrs. This unit returned thence on 27 Jan, and the SD & G Highrs immediately took its place to carry out a similar programme of hardening training (War Diary, "G", HQ 3 Cdn Di v, Jan 43). This unit returned from Scotland on 18 Feb (General Report from First Cdn Army, week ending 20 Feb 43). Numerous references to this Assault Training programme will be found in CMHQ file 2/COMB OPS/1. The general assumption behind it was that "important elements of 1 Cdn Corps, specially constituted for the purpose" had been assigned "the task of landing along a portion of an enemy occupied and defended coast, with the object of advancing with all speed to capture an important post and airfield some 20 miles away" (Letter ASSAULT/5-1-5/TRG from Adv HQ 1 Cdn Corps, 4 Dec 42). 14. Certain other units of 3 Cdn Div also engaged in special training. The Pioneer Company of the division's machine-gun unit, the Cameron Highlanders of Ottawa (MG), went to Scotland for training, as did 300 all ranks of 8 Cdn Inf Bde (General Report from First Cdn Army, weeks ending 2 Jan and 9 Jan 43). At the same time 6 and 16 Fd Coys RCE, proceeded for training to the CTC at TROON, where they remained for some time (General Report from First Cdn Army, weeks ending 9 Jan and 16 Jan 43). Selected personnel of 3 Cdn Div RCE had previously engaged in combined operations training at POOLE (General Report from First Cdn Army, week ending 19 Dec 42). 15. Certain other special training should be noticed. Driver training was carried on a large scale; late in December, for instance, drivers of all arms of 1 Cdn Div were training in Scotland, the work concentrating on driving on and off landing craft of various sorts. This training was extended to certain drivers of 2 Gdn Div (General Report from First Cdn Army, week ending 26 Dec 42). Artillery drivers of 3 Cdn Div had previously had four days LCT training (General Report from First Cdn Army, week ending 30 Nov 42). During the week ending 23 Jan 43 there was further driver training for 3 Cdn Div RCA at the CTC, ROTHESAY. 16. Certain Corps and Army units also underwent combined training during this period. 13 Cdn Army Fd Coy, RCE, trained in Scotland in combination with the 7 Cdn Inf Bde "B" Brick (Beach Organization) (General Report from First Cdn Army, week ending 12 Dec 42). Subsequently, 12 Cdn Army Fd Coy, RCE, proceeded to the CTC at TOWARD (9 Jan 43) and trained there for some time (General Report from First Cdn Army, weeks ending 9 and 16 Jan 43). During the week ending 19 Dec 43, selected personnel of 1 Cdn Corps Tps RCASC underwent training in Scotland (General Report from First Cdn Army). 17. There was also some combined operations training by Canadian armoured forces at the CTC, POOLE; two squadrons of 14 Cdn Army Tk Regt (1 Cdn Army Tk Bde) trained here during the week ending 23 Jan 43 (General Report from First Cdn Army). 18. Considerable attention was also given to instruction in the planning of combined operations. Combined Operations Planning Courses were held at the CTC, LARGS, for the staffs of both 1 Cdn Div and 3 Cdn Div, the GOC 1 Cdn Div with his senior staff officers attending from 28 Dec 42 to 3 Jan 43, and the GOC 3 Cdn Div (Major-General R.F.L. Keller) with his senior staff officers going to LARGS for a similar course on 11 Dec 42 (War Diaries, "G", HQ 1 Cdn Div, Dec 42 and Jan 43, and "G", HQ 3 Cdn Div, Dec 42). Brigade Planning Courses were also held; for example, during the week ending 2 Jan 43, the commander and staff of 2 Cdn Inf Bde took such a course at one of the CTCs (General Report from First Cdn Army). 19. The above account is necessarily incomplete, particularly with respect to the training of sub-units. The files used are not wholly satisfactory sources, and no consolidated list of sub-units actually trained appears to be available. The general course of the programme, however, is outlined to the extent likely to be required by the Official Historian. 20. It is unnecessary to comment on the value of training of the sort that as been described from the point of view of the morale of the troops. Combined operations training is obviously extremely valuable in this respect. Its strenuous and unusual nature, and the fact that it involves a change of scene, combined with the further fact that it is invariably interpreted as holding out the hope of active employment at an early date, makes it an extremely popular activity. There is no doubt that the programme of combined operations training, while increasing the efficiency of the formations concerned with a view to their employment in any amphibious offensive operations which may be projected, has made an important contribution to the maintenance of the spirit of the troops involved. This is a preliminary narrative and should not be regarded as authoritative. It has not been checked for accuracy in all aspects, and its interpretations are not necessarily those of the Historical Section as a whole. Ce texte est preliminaire et n'a aucun caractere officiel. On n'a pas verifie son exactitude et les interpretations qu'il contient ne sont pas necessairernent celles du Service historique. We are indebted to the Directorate of History and Heritage, National Defence HQ in Ottawa, Canada for permission to reproduce this 1943 report on Combined Operations Training. The report originated from Canadian Military Headquarters. For those interested in the status of the report please click here. Also of possible interest is the Canadian Military History website. Part I was written by Lieut. W.A. Ogilvie, a Canadian War Artist attached to CMHQ and part II by Major C P Stacey, Historical Officer, Canadian Military Headquarters.